Winner of the 2011 Pulitzer and 2012 Tony for Best Play, Clybourne Park is a clever time capsule, satirizing the polite bigotry of the '60s by contrasting it with today's earnest avoidance of the political and psychological force of race and class. The well-acted production at Northern Stage is not a depressing analysis of the problem but a comedy that skewers characters frantically evading the issue of prejudice. The play's structure sets up parallels so that each moment onstage is engaging on multiple levels. 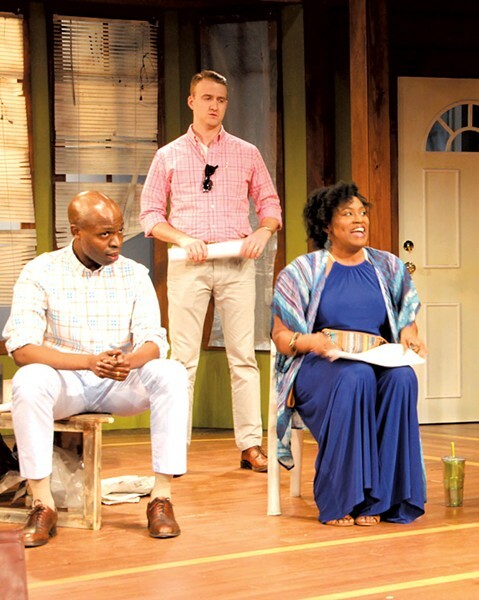 Playwright Bruce Norris links his story with Lorraine Hansberry's 1959 play A Raisin the Sun by borrowing one of her characters and imagining where he might go after failing to bribe a black family not to move to his all-white neighborhood. Karl Lindner's next step is entering Norris' play, where he tries to pressure Russ and Bev, a white couple, not to sell their house. By carrying Hansberry's story into several white lives, Norris shows the new points of view of the white homeowners, Karl's wife, the household's black maid and her husband, and an ineffectual pastor. Norris constructs another parallel by using the passage of time and two impressive theatrical effects. Act 1 is placed in Raisin's 1959, while Act 2 occurs 50 years later in the same house. By 2009, the neighborhood has deteriorated, and a white couple wants to take advantage of depressed property values to buy the house, demolish it and build an architect-designed mansion 15 feet taller than anything else on the block. The racial clashes are similar, but this time are couched in zoning laws and design restrictions. Now the core conflict is between a solidly middle-class African American couple negotiating for design restraint, on the one hand, and upwardly mobile white people, on the other. The same seven actors return in new roles, with echoes of the conflicts in Act 1 but using today's language of social grievances and disenfranchisement. Now the attempts to discuss the racial overtones quickly veer into politically correct clichés and racist jokes. In 50 years, it seems, we've only gained the courage to mask the problem differently, while daring ourselves to laugh at jokes based on stereotyping. The other performer is the set itself, which is transformed from the handsome Mission-style bungalow of 1959 to a derelict husk. By making the audience remember the rich wood paneling and welcoming window seat while looking at their trashed remains, the set powerfully tells the story of urban renewal and historic preservation. Despite the charged subject, in the end this is a situation comedy. The situation might be the most powerful conflict in American society, but it's treated here with witty banter, physical humor and superficial characters. The neat twist is that jokes are sometimes used to reveal the tension, not to release it. Director Chad Larabee has facilitated an ensemble approach to the play, and the acting is polished and powerful. He creates some searing moments when artifice is stripped away, and the professional cast works together in impressive harmony. With strict attention to the comic potential, Larabee doesn't explore character depth. The play opens with Russ and Bev at their habitual distance, and the director doesn't establish Russ as a ticking time bomb, or Bev as the fearful wife who can't defuse it. Instead, they play estrangement like a typical tired couple. The first act works, but it lacks the slow build to a volatile release. Larabee focuses on humor alone in the second act. Eric Bunge is a carefully walled-off Russ, too subtle to make us fear his pent-up rage but heroic in his command of his feelings. As Bev, Denise Cormier begins as a nervous caricature, but by the end of Act 1 she's gently, desperately grasping for hope. Loren Dunn shows Karl trapped in the dilemma of wanting something without being able to ask for it. In tight, constrained movements, he pleads in gestures that are half-concealed, placating and provisional. In Act 2, Dunn's hard-charging, home-buying husband struts about with his jaw thrust out, showing the easy confidence of money and power. Jarvis Green is effectively wry as the maid's husband, courteous to the white people but splendidly capable of voicing the truth they're afraid to say. Ashley Everage brings riveting poise and power to her roles. She shows the balancing act the maid maintains between inner pride and meeting her white employer's know-your-place expectations. When her husband can't pick up the behavioral cues she frantically signals, Everage shows the character wincing between her two worlds. In Act 2, Green and Everage are effective as middle-class liberals, tangled in tactfulness. As Act 1's craven pastor, Tyler Caffall is a charming, comic mouse. In Act 2, his distracted city administrator captures a man half-listening, absorbed in his own interests. Jenni Putney plays Karl's deaf and pregnant wife in Act 1, earning some startled laughs, and the would-be new homeowner in Act 2, who wants what she wants when she wants it. Caite Hevner Kemp's set is magnificent in design and execution. The warm wood, detailed Mission staircase, and post-and-beam architecture root the entire play in a tangible place. All the contrasts Norris invokes begin with the notion of home as a refuge, a source of identity and a crucial investment. Kemp's set, showing two stages in that house's life, visually brings the play's themes to life. Costumes by Laurie Churba-Kohn, lighting by Stuart Duke and sound by Ben Montmagny all show Northern Stage's high professional standards. Race is not a subject that can be resolved in a story, so Clybourne Park owes us no tidy ending. What's disappointing, though, is how often it lets jokes stand in for revelations. The play is itself an artifact, demonstrating the current safe limits of examining race and class. Humor might be the only polite tool people can use when uncomfortable, but Norris is so much at pains to depict the civil stalemate of race relations that he neglects anger, the impolite response. When this production does brush up against the real grief, fear and rage hiding below the surface, it's spellbinding; when it offers laughs at easy-to-mock characters, it's an entertaining comedy pretending to be much more. The original print version of this article was headlined "Price and Prejudice"